Bleu violon is circus, Bleu violon is music but, above all, Bleu violon is a surprising blend of human and specially created cartoon characters, all condemned to live together. They spy on each other, tear each apart, help each other, push their fears to breaking point, and dare to play funny and cruel tricks on each other. "It's the story of a confined space and those who live in it. Outside, chaos seems to reign. The inhabitants of the space let time slowly pass and this has the effect of slowly fossilizing them. Sometimes, they tempt fate, blow trumpets, throw objects or turn chairs around. Often they are happy just to watch the rain go by and tremble with fear while inventing short-lived, daring adventures. Inside the cracks in the walls, a whole colony of free, parasitic creatures has settled, sketched in the vacuum, babbling, monstrous. Le Boustrophédon has made some innovating, original and wacky research with Bleu violon. All the animations were created especially for the show and are projected onto walls, objects, clothing or in the condensation on a window. This imagery coveys perfectly the message, the actors (real or animated) and the emotions which flow through them. The five actors come from a circus arts background. They are jugglers, acrobats or tightrope walkers and in previous shows they have mixed their traditional skills with puppet handling and living music. 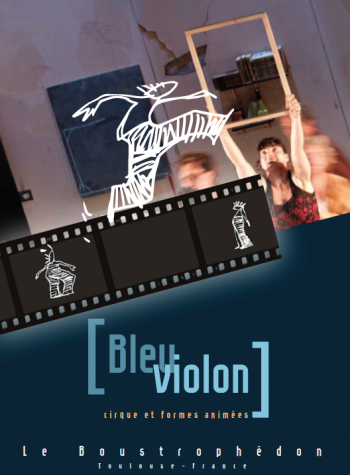 With “Bleu Violon” they will be exploring the field of animated pictures. They have been professionally trained in renowned circus schools, recognized for their demanding and high-quality teaching: Le Lido (The Centre for Circus Arts in Toulouse) and one of them at ESAC (Higher School of Circus Arts in Brussels). Along with the animated films director, two specialists in video technology have also joined the project. They are able to explore the technical possibilities required to transform the ideas we come up with into workable elements. Like puppets, animated pictures allow us to keep the gravity of the theme at a distance. They offset the subject matter with humour and peculiarity… This is how “Bleu Violon” charts a path between the comic, the serious and the original. It creates improbability and surprise … The animation is totally integrated into the action and emotion of the show and flirts with the fields of magic and illusion. Daniel Masson - actor, piano, mélodica, singer. Romain Delavoipière - acrobat, clown, saxophonist, singer. Héloïse Biseau - acrobatics, contortion, flut, clarinet, singer. Alan Leborgne - climbing, dance, actor, singer. Collective writing and research directed by Christian Coumin. We are all – at an equal level – involved in the show we are creating. The writing process draws in the technologies that we explore, the dreams we experience and our perspective on things. 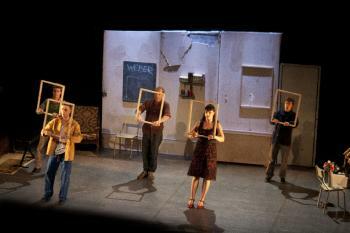 The director needs to respect those on stage in order to have an effective inside viewpoint. It’s a question of accuracy, inevitability and simplicity. That’s why we describe it as "directed collective creation". It is neither the work of a single person, nor of an autonomous group. We are constantly aiming to achieve an exhilarating (un)balance. 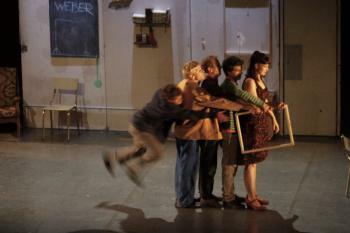 Direction (collective), led by Christian Coumin (F) – Theatre and actor direction. Artistic Director of the company and also Artistic Director of the Lido de Toulouse (internationally renowned circus school) since 1996. He has directed all of the company's shows, events and acts and participated in the development of its teaching aspects. He has also directed the Acrostiches, la Cie 111, Vis-à-vis, Léonor Canalès, les Pas en Rond, les Skouts, Triplex, Tibo tout court, Remise à 9, Marie Céline Daubagna, les Singuliers, Alex Saintin, les Dodder’s, Pierrot le fou, Michel Navarro, Vent d’Autan, Iéto, Le petit Travers and la Compagnie Singulière. 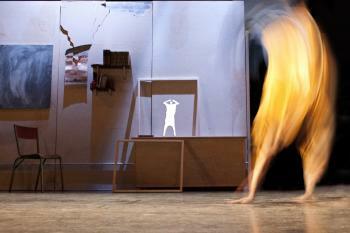 Production Le Boustrophédon, in partnership with the studio La Ménagerie. > L’Hostellerie de Pontempeyrat / Association Regards et Mouvements (Usson-en-Forez-42).